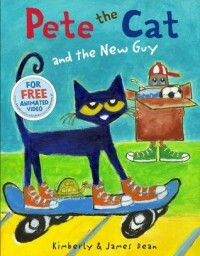 Awesome Pete the Cat book where Pete gets a new neighbor. Pete is shy at first to talk to the new guy but eventually does. Pete and his new friend go to play with all of Pete's friends one at a time and each friend they visit they try to do something together but Pete's new friend is unable to do each of the things they can do. Pete's new friend gets sad he can't do any thing. Then Pete's hears his new friend playing music and Pete and his friends join the new guy and they are all happy again that they finally found something they can do together. You could use this book in the classroom to teach about diversity or how it can be hard to make new friends. You could use this book for grades K-3.